Fortunately, my doubts were well misplaced and I did make it down safely. And in reality, it wasn’t that dangerous. In fact, I was in no real risk of falling to my doom. As you’ll remember, Peter went down first. 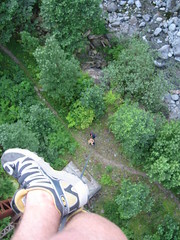 One of the things I learned on my way down is that when sufficient tension is applied on the free-side of the rope (i.e. the rope that is below me), I stop. As it turns out, a person below is easily capable of supplying that tension. VoilÃ ! Instant safety net. Actually, the funny thing is that before I stepped over the rail, Peter had yelled to me that if I fell, he could catch me. I was trying to figure out how exactly he was going to do that and surmised that he was going to quickly maneuver his pack under me and hope that broke my fall. Needless to say, I wasn’t very inspired by Peter’s original comment. But after I was on the ground again, it all made sense. Next PostNext I Know a Scam When I See It, Do You?